Careful With That Axe, Eugene: Our Brian Wins Pie Competition!!! 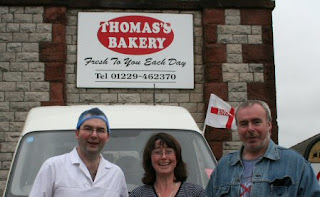 The brother Brian's bakery, Thomas's Bakery in Dalton-in-Furness, has won a Best Pie Competition in Cumbria run by a local radio station - Abbey FM. 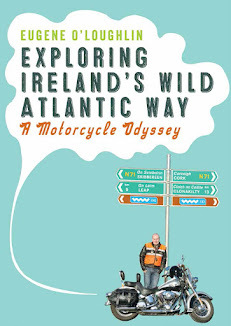 The competition was organized by the radio station in response to the Hairy Bikers - see the article "Pies in their Eyes" on Abbey FM's web site. The picture on the left of Brian, my sister Kathleen, and I was taken outside Brian's bakery in Dalton in June 2006. This was during the 2006 European Football Finals in which England were taking part - hence the St George's Cross flag on Brian's van. I contacted the News team at Abbey who kindly supplied the reports in MP3 format. They also gave me permission to reproduce the clips here - many thanks to Rosie Hillman for sending me the files. I plan to add more photos and reports on this to my blog. It's not every day that your brother wins a "Pie-Off" competition. Well done Brian!! !